Emergency Laparoscopic Common Bile Duct Exploration in Acute Cholangitis with Common Bile Duct Stone Patients. INRTODUCTION There is many modalities in the treatment of common bile duct (CBD) stone. Among the patients who were performed cholecystectomies due to gall bladder stone with acute cholecystitis, about 3-14% cases were accompanied by CBD stone. Under the unavailable situation of ERCP, especially in emergency circumstances, laparoscopic cholecystectomy, choledochotomy, CBD exploration, CBD stone removal, T-tube insertion and intra-operative cholangiogram are effective method to relieve the symptom of acute cholangitis, jaundice and biliary septic condition. METHOD AND PROCEDURE To estimate the operative safty and efficiency of emergency laparoscopic CBD exploration, we planned this study. From the January 2008 to August 2009, 14 patients data were prospectively collected and evaluated. All patients were admitted our hospital by way of emergency department due to fever, biliary colic, jaundice and panceatitis. After routine laboratory analysis and abdominal computed tomography, acute cholangitis with CBD stone was diagnosed. All operations were usually conducted in the night or weekend. The operations were conducted 4-port method. After laparoscopic cholecystectomy, choledochotomy was made by endobovie or endoscissor. The CBD stones were eliminated from CBD by fogarty catheter or stone basket. Generally, fully removal of CBD stones, rubber or silastic type T-tube was inserted in the CBD and then intra-operative cholangiogram was carried out to confirm the residual stone. 2-weeks after the operation, follow-up cholangiogram was performed to check out the residual or recurred stones. RESULTS The male to female ratio was 9:5. The mean age was 65.2 years old. And the mean operation time was 255 minutes. Gas was passed post-operative first day. Diet was started post-operative second day. Two patients were converted to conventional open method due to severe adhesions and inflammation. In the follow-up cholangiogram 2-weeks after surgery, 4 patients were found stones in CBD. They were treated by ERCP. One patient was not need to insert T-tube due to clearance of CBD after exploration, so primary CBD closure was performed. 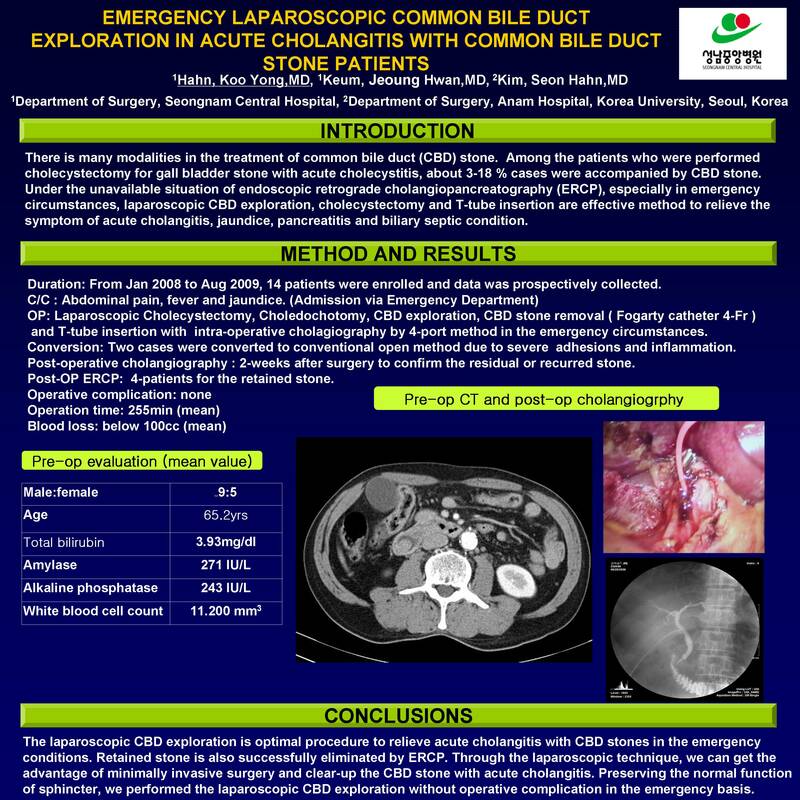 CONCLUSIONS The laparoscopic CBD exploration optimal procedures to relieve the symptoms of acute cholangitis with CBD stones in emergency conditions. Retained stone is also successfully eliminated by ERCP. Through the laparoscopic technique, we can get advantage of minimally invasive surgery and clear up the CBD stone with acute cholangitis without complications in the emergency basis.